KHBS-KHOG Press Release Arkansas native Laura Huckabee has been named meteorologist for KHBS/KHOG-TV. An NWA-sealed meteorologist, Huckabee will bring twenty years of television forecasting experience to 40/29 News Sunrise, the station’s 4:30 – 7:00 a.m. weekday morning newscast. Huckabee’s family roots run deep in Arkansas, including being cousin to Mike Huckabee, Arkansas’ former Governor. For ten years Laura Huckabee was a fixture on WGCL-TV in Atlanta, where she worked as morning meteorologist for the CBS affiliate in the country’s 9th largest television market. While there, Huckabee periodically traveled to New York City, where she delivered national forecasts for the CBS Network’s Saturday morning broadcast. A native of Jonesboro, and graduate of Arkansas State University, Huckabee’s 20 year career includes weathercasting positions at KAIT-TV in Jonesboro, KARK-TV in Little Rock, KOAT-TV in Albuquerque, New Mexico, KUTV-TV in Salt Lake City, Utah, in addition to WGCL-TV in Atlanta. She earned her Master’s Degree in Secondary Education, and for the last two years has been teaching advanced science courses to middle grade students in the Atlanta metropolitan area. She’s also worked as a freelance meteorologist for several Southeastern television stations. You can see Laura weekday mornings from 4:30 – 7:00 a.m. on 40/29 News Sunrise beginning May 14th. > First... News 2.0... (WFMY is channel 2)... Next they put in a weather garden and re-did the news sets... and starting this last week... a Today's THV style Good Morning show. The former evening weather guy is the main anchor for the new morning show... he probably has the most personality at the station. The former morning anchors... one is now a feature reporter, the other is the weekend morning show host along with the former morning weatherman. > A weather Garden!..I have no idea what the weather gang thinks of the Weather garden either, but I know one got locked out of the building before they figured out to put a swipe card on the back of the weather clicker. Another keeps getting dive bombed by a territorial bird and apparently they are close to a fire station because every once in a while they get drowned out by sirens. > Faith Abubey is here from LR, too. > Audas has been bringing in new faces that seem to be an improvement over what they had. Just in time for May sweeps a new reporter is on the streets for KARK, Channel 4/Little Rock. 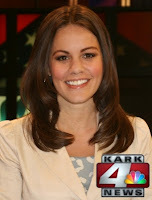 Jocelyn Tovar comes to KARK from KTXS/Abilene, Texas where she was the stations crime/courr. According to her bio at KARK's website, she has also worked as a Washington, D.C. correspondent for KFDX-TV in Wichita Falls, Texas. Note: For the first time in more than 16 years, ABC's Good Morning America did best among total viewers, according to Nielsen. Source: KTAL Veteran broadcaster H. Lee Bryant died today at 89. Bryant was vice president and general manager of KTAL-TV for more than four decades. He retired from the station in 2000, after it was purchased by Nexstar Broadcasting. Source: KLRT Press Release WeatheRate, the Nation’s only independent weather forecast research firm, has bestowed it’s “most accurate weather forecast” seal of approval upon FOX16 for their most recent annual measurement cycle. WeatheRate independently verifies the accuracy of daily TV weather forecasts across the country. FOX16 was determined to be the most accurate Little Rock TV station in a station-by-station comparison over a 52 week period. FOX16’s weather team is anchored by Chief Meteorologist Jeff Baskin and Meteorologist Chad Garneau. Both meteorologists are AMS Certified and can be found on FOX16 News @ 5, 5:30, 9, and 10 and anytime on FOX16.com and our FOX16 mobile App. Well some things have changed since I last viewed the program about two weeks ago. Note: I watch via KTAL/Channel 6 out of Shreveport, oh excuse me "Texarkana". > Well they still run the KTAL news ticker at the bottom of the screen, mixed with the KARK graphics. Still looks a mess BUT they did add the Channel 6 logo in the bottom right! If you want true ArkLaTex news we have to read the ticker! > Still too many Arkansas stories, oh wait, it is Arkansas Today not ArkLaTex Today. I still don't understand why Nexstar isn't utilizing the newsrooms and journalists it has on staff in Northwest Arkansas, Shreveport, oops I mean Texarkana and in Monroe. Why not just send those folks home if you are not going to use what you've got. > Still local weather cut ins...how funny. And still a local evening news tease. I guess as a viewer I am expecting too much. I mean come on lets see some news. Nexstar shouldn't expect much in the ratings category in the KTAL and KNOE markets. Folks down here in Arkansas watch the Little Rock stations...and the folks in Texas and Louisiana watch the Shreveport stations. And at noon the Louisiana viewers will be watching KSLA, Channel 12. All but one time slot was won by KATV, Channel 7 in the February ratings book. According to ratings number published by Arkansas Business.com KTHV, Channel 11 won only time slot, at 5am. To view all the numbers visit the ratings chart. Wow what a story the Bobby Petrino motorcycle wreck has become. In hearing folks talk about it today a lot of the folks were shooting down the media. I heard one guy today say why did the media have to report it. He questioned whether if this was really "news". Then you read all over the social media sites how folks blame the media for just spreading rumors and not facts. Sometimes folks just want to live in their own little perfect world. But Hog fans...don't shoot the messenger! Source: Press Release Brittany Bell joins KHBS/KHOG-TV (Channels 40 and 29) as Meteorolgist and Reporter in April. Bell will anchor 40/29 Weather at 5:o30, 6 and 10pm on weekends, report throughout the week and online at 4029tv.com. Bell has worked as a fill-in meteorologist for WMC-TV in Memphis, Tennessee. Bell also served as Meteorologist for Mississippi State University’s digital broadcast, Campus Connect, and interned as Meteorologist for Memphis television station WPTY. Bell is also a severe storm chaser and Skywarn storm spotter. A scholarship recipient from the American Meteorological Society and at the top of her class, Bell will graduate from Mississippi State University in Starkville, Mississippi this May. Bell will receive her Bachelor of Science degree in Professional Meteorology. Bell was recently selected as a finalist for the Mississippi Associated Press college weathercaster award. Local TV broadcasters tallied $1.97 billion in online ad revenue in 2011, according to a new study from Borrell Associates, a 41% increase over 2010. Stations are forecasted to blow past the $2 billion threshold this year. Borrell Associates forecasts $2.7 billion in local TV online revenue, a 35% increase over 2011. Borrell revealed the numbers in its new Benchmarking Local Online Media survey. "Local TV broadcasters continue to grow online ad revenue at an impressive clip," said the study, which singled out Gray Television and Meredith for growing revenue at a 50% rate in the last half of 2011, along with LIN, Nexstar and Gannett for their digital gains as well. Station groups partnering with Yahoo, such as Gannett, to help sell online inventory is a factor in the station digital growth. Newspapers claim almost 25% of a market's local online ad revenue and broadcast TV takes 12%. Pure play digital outfits, meanwhile, grab over 46%, while radio gets 1.8%. Where do I start. First off I don't work in the TV News biz or anything close. I am just a regular viewer having grown up in Southwest Arkansas having access to all Shreveport and Little Rock stations on my cable system. With that said here is my opinion and what I think what needs to be improved on with the new Arkansas Today. > First off-- Branding.. Come on go ahead and stick that Channel 6 logo up there next to the ticker and let folks know they are watching KTAL and not some new channel on the TV. But then again the goal may be NOT to associate Arkansas Today with the "local" station. > Use your resources--Fill the time with news not fluff stories. You are attempting to provide information to the whole state of Arkansas and beyond. You have newsrooms and journalists you are not utilizing that could fill your entire 30 minute program with news! You are paying those folks...use them! > Local cut ins-- Really? Doesn't this beat the purpose of the whole concept of the program. Dee should do the weather PERIOD! I have to wonder how many people out of Arkansas is watching this newscast. If I lived in Texas or Louisiana I know I wouldn't be interested in all the Arkansas news. What I can't grasp is the fact there are newsrooms down in Shreveport and Monroe and they aren't allowed to put on their own noon news program. You've got them on the payroll utilize them. People want to see their local people and get their local news. But I guess it is saving a dollar or two. Off work today so I thought I would check out Arkansas Today. Please note I am watching KTAL Channel 6 via cable. Right off I notice all local branding is gone BUT I switch to KARK and well they have their logo in every corner. KTAL's ticker is down on the bottom of the screen but no sign it is KTAL we are watching. Right now during weather, the severe weather in Northeast Texas was pointed out. No mention of the severe storms that marched over North Louisiana last night. Now a weather cut in with KTAL Met Patrick Dennis. Really? I feel like I am watching one of the national morning news programs. Let's wait for sports! And now to an Arkansas Nation report. Wonder how many people in Louisiana and Texas are actually watching? ..or care about Arkansas sports. Okay the clashing of the graphics has got my attention now. KTAL doesn't have the same graphics as KARK and KARK's lower thirds are clashing with the cheap looking KTAL news ticker. KARK's graphics are slick...KTAL's dull..
Is there any news happening today? Not one LIVE shot from any reporter. I thought they were going to have numerous sat trucks and LIVE vans on the road. Oh now we have a news cut in from an anchor at KTAL...just giving us headlines...YAY there is someone working in the newsroom in Shreveport. All promos for the evening newscasts. geez. And now KTAL goes into paid programming.. Paid programming midday, sounds like a sign of desperation. 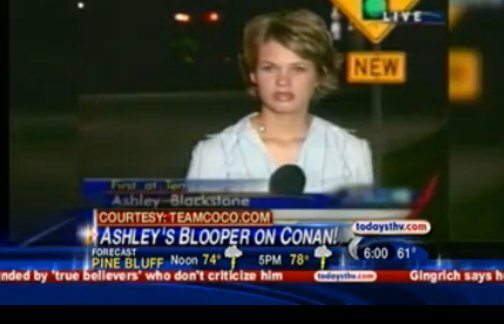 A blooper of KTHV Anchor/Reporter Ashley Blackstone was shown on Conan O'Brien's late night show last night. The blooper occurred early in Blackstone's career in another market. You can watch it HERE. Seeing how the use of social media websites is being embraced by media worldwide, local blogger, Arkansas Patriot thinks one Little Rock TV station is carrying it just a little too far. Last week when a 4 year old boy went missing KARK invited its followers on its facebook page to "LIKE" the post to send prayers and thoughts to the family. THEN over the weekend when head U of A coach Bobby Petrino was involved in an accident the station put up a post to LIKE to send your support. Here's what Arkansas Patriot has to say, "Keep in mind this was well before any information had been released about Coach Petrino’s condition. We literally did not know if he was dead or alive. But, who cares! ”LIKE” away! According to the Arkansas Patriot blogger one of the contributors to the blog has now been blocked by KARK from seeing its Facebook page. Ah, how professional. 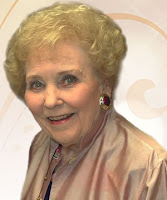 A familiar face to AETN viewers passed away last week. Jane Krutz had volunteered at AETN for more than 47 years. In a memorial to Kruntz, AETN Executive Director Allen Weatherly says "Ms. Jane has been invaluable to AETN since the very beginning." "It is literally true that there might not have been an AETN without her. In fact, she was advocating for a public television station for Arkansas years before we finally made it to the air in the mid 1960s. We have been so fortunate to have someone so involved and outspoken on behalf of AETN and public media as a whole. In 1995 she testified before Congress and took a powerful stance about the power of public television in America and in Arkansas. She was just a remarkable person." Source: Arkansas CW Press Release For the second consecutive ratings period, The Arkansas CW is among the nation’s leading CW affiliates. Vampire Diaries – one of the CW network’s biggest primetime hits, delivered a 4.3 rating with Women 25 to 54 on the Arkansas CW, placing its performance among the top 10 for all CW stations in the country. Vampire Diaries helped strengthen the overall primetime ratings performance of The Arkansas CW, significantly over-indexing the CW’s national viewing average in the advertiser-coveted demos of Adults 18-34, Adults 18-49 and Adults 25-54. Among Adults 18-34 the Arkansas CW’s primetime average was 43 percent higher than the CW national primetime average. In Adults 18 to 49 the station over-indexed the national average by 14 percent. Demonstrating the station’s growing broad-based appeal, in Adults 25- 54, the Arkansas CW over-delivered the national CW average by 14 percent. · Jerry Springer M-F at 12pm posted share growth over November 2011. Adults 18-49 were up 73% while Women 25-54 were up 93%. · Maury Povich M-F at 11am was up 40% in share of Women 18-49 and up 75% in share of Women 25-54. Seinfeld Monday through Friday at 6:30pm had over 200% share growth over November 2011 in the key Adult 25-54 demo. The Vampire Diaries posted ratings growth over February 2011: Women 18-49 were up 36%, while Women 25-54 shot up by 95%. The Secret Circle had tremendous ratings growth over February 2011 in the key 25-54 demo: Adults 25-54 were up 75% while Women 25-54 were up an impressive 300%. Hart of Dixie posted solid shares in February 2012: 3.9 for Adult 18 to 49 and 4.6 for Women 18 to 49! The Arkansas CW is a full-carriage multicast channel of KHBS/KHOG-TV. It launched in April 2008, making this month its 4 year anniversary. The Arkansas CW is available over the air on channels 29.2 and 40.2 and can be found on DirecTV, Dish, Cox Cable, and Sudden Link cable.